Synopsis: Reflexology is a simple and powerful hands-on healing technique that can dramatically improve the health of every body. Anybody can learn how to use their fingers and thumbs to reduce tension, increase circulation and improve well-being on all levels. Reflexology For Every Body was created to enable anyone, anywhere, to apply reflexology. It is the ultimate instructional manual for acquiring excellence in reflexology. This comprehensive book contains everything that a beginner or a practising reflexologist needs in order to become the best reflexologist they can be. Start at the beginning with the basics and work your way through the book to more advanced levels. From front to back, this book contains the equivalent of three levels of reflexology instruction, presented in an extremely user-friendly way. The author combines twenty years of experience in the field of reflexology and wholistic healing with her passion for writing and instructing to create Reflexology For Every Body. Step-by-step, the author clearly and enthusiastically guides the reader into the healing world of reflexology. The sections on reflexology theory, principles and technique are thorough and detailed. Numerous foot and hand charts and diagrams show the reflexes for feet and hands. Colouring the charts and diagrams help you to learn the reflexes. Instructions are included. The technique section describes the body area or part, shows where to go for the reflex, and describes how to work the reflex and what to work it for. Included are anecdotal stories from the author's experience as well as wholistic health insights for taking care of this body part. All of this is written in layman's terms with a light touch; a wonderful way to educate yourself about the body and learn how to improve its health. At the end of this section, an overview checklist makes it easy to follow along as you give a treatment. The third section is a guide to anatomy and physiology as they apply to the study of reflexology. The eleven body systems are described with emphasis on reflexology points for each system and mind/body aspects. Section four takes you further on the footpath with a guide to using reflexology for common health conditions, pregnancy and delivery, babies and children, hiking and skiing, yourself and pets. A "Quizzing Yourself" chapter lets you test your knowledge of theory and technique. Reflexology Resources helps you choose courses, reflexology tools and books, and shows you where to go for more information on reflexology organizations and associations. In the final section, the author shares what she considers to be the best of the natural healing world based on her more than 25 years using natural remedies. From Acidophilus to Whole Foods, these 63 entries will inspire, educate, touch your heart and lift your soul. The appendix explains how to take care of our feet, gives an overview of the history of reflexology and explores the many ways in which reflexology may work its magic on the body. Everything about this book is user-friendly; the hands-free spiral lay-flat binding, the large 8.5x11" page size, copious clear diagrams and charts, easy to follow headings and cross-references and the extensive index. There are even two tables of contents; a short one to help you find things at a glance and an extremely detailed one for specifics. By the time you have finished this book you will have many excellent tools with which to improve your own health and that of your family, friends and clients. You will have a thorough understanding of the body and how it works. You will have at your fingertips, the clearest, most easy and fun to use, comprehensive reflexology instruction ever. All you have to do is practise what you have read and begin to create positive change! From the Author&colon; In my early years of practising and teaching reflexology, I had many people express the need for a really good reflexology book. Some had no access to courses but wanted to learn reflexology. A book was needed that would provide complete instruction for anyone, anywhere. I felt that I was a good candidate to write such a book because I was passionate about reflexology, I loved to teach it and I loved to write! I had used reflexology on its own for many years and was confident with its use and application. The reflexology books that I had read were impersonal and hard to follow. A good reflexology book needed a personal touch. I wanted to write a book that was fun and interesting as well as clearly presented and easy to follow. 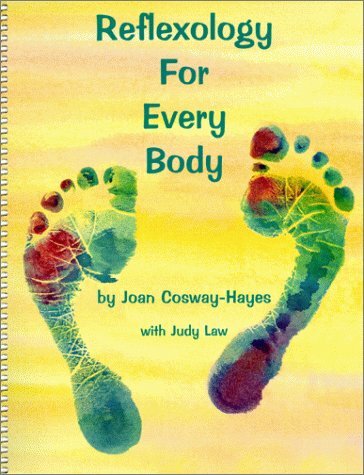 It had to be the most user-friendly reflexology book on the market. It was very important that a person be able to use my book not just to learn reflexology but to develop excellence in reflexology. I am a meticulous type of person who pays extreme attention to detail, especially when I work the feet. My book had to impart that same attention to detail and excellence in the application of reflexology while at the same time being fun and light. This was not too hard a challenge because that was how I taught my students. So as I was writing Reflexology For Every Body, I imagined that a student was sitting with me and I was teaching them the art of reflexology. That enabled me to focus on presenting the information so the student understood the basics and grasped the intricacies of technique. I also got to share anecdotal stories relating to my experience of working the feet and include some related wholistic health information. Having my student with me in the writing process kept my writing personal, light and warm. As a result, my readers feel like that lovingly mentored student! I also wanted to include a chapter on natural healing that would allow me to share what I had learned in 25 years of using whole foods and natural healing techniques. It was important that I be able to share from my heart some of the things that I value the most, but also to give the reader information and tools with which to make positive health changes. So I created the last chapter...the best of the natural healing world. This was my favourite chapter to write and has been many people's favourite to read. It is my most sincere wish that every reader would be brought to a higher level of well-being on all levels through my book, and that through learning to apply reflexology, they would begin to create positive changes in themselves and in the people closest to them. This increase in health and well-being would in turn affect communities, then nations... the planet! I would love to see a reflexologist in every household, creating positive transforming change. Over 20 years of practising reflexology, I have seen the regular application of reflexology change lives for the better. Miracles have happened and reflexology has been a significant part of those miracles. I would love to tell you stories and stories.... but to finish off, I trust that through Reflexology For Every Body you will learn everything you need to know about reflexology and that you will come to share my passion for reflexology and natural wellness. I hope that you will actively use whatever you have learned about reflexology to benefit yourself and others.